Show Us Your Books: Top Reads of 2017! Why yes, there was a Show Us Your Books post earlier this month. 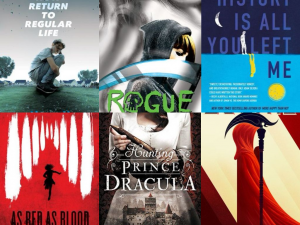 This time though, we are all sharing our top reads from the past year! 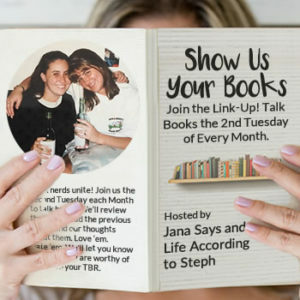 As always, I’m linking up with Jana and Steph! First off though, if you celebrated Christmas yesterday, I hope it was fantastic and not full of stress! To figure this out, I decided to go back on Goodreads and share all the books that got a 5-star rating from me. There were quite a few, so hopefully you’ll find something that stands out! Have you read any of these? Are you planning to now? I’m going to break these up into categories – Middle Grade, YA, and Adult. 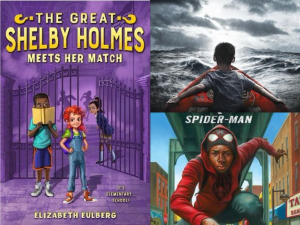 The Great Shelby Holmes Meets Her Match by Elizabeth Eulberg – second book in the series, but you can always read them out of order if you want. A pre-teen, female Sherlock Holmes! Miles Morales by Jason Reynolds – the novel adaptation of the comic book series, where Spiderman is a black teen. I need this movie! Refugee by Alan Gratz – this book should be read by everyone. Follows three generations of refugees (from Germany, Cuba, and Syria). As Red as Blood by Salla Simmuka – the first in a series, translated from Finnish. I cannot wait for the sequel. Hunting Prince Dracula by Kerri Maniscalco – The second book in the Stalking Jack the Ripper series – you must read both of these! Historical fiction at its finest. We Now Return to Regular Life by Martin Wilson – top contemporary novel right here! It deals with a kid coming home after being kidnapped but the point of views are his old best friend and sister. History Is All You Left Me by Adam Silvera– one of my top favorite LGBT+ novels. How do you move on from your ex when they pass away, and they weren’t dating you when they did? That’s the biggest question in this novel – Adam Silvera is a favorite of mine, so read all his stuff. Scythe by Neal Shusterman– this book has been out for a bit, but I just read it this year. So so amazing. It’s a future world where people are appointed to kill because death no longer exists. Even if you don’t read YA, I’d recommend this. The sequel comes out soon! Rogue by Gina Damico – second book in the Croak series, where a teen finds out she’s a Grim Reaper. All the books are great, but this one was definitely five star worthy! We Wish You a Murderous Christmas by Vicki Delany– the second in a Cozy Christmas series. Such a fun murder mystery – yes, I realize that sounds wrong, but if you know cozies, you get it! Whiteout by Elyse Springer – definitely a suitable winter read! A m/m romance with a dose of amnesia! Peter Darling by Austin Chant– this is such an amazing take on Peter Pan, because Peter Pan and Wendy are the same person! Yes, a transgender Wendy who falls in love with Hook. Read it! A Murder in Time AND A Twist in Time by Julie McElwain- the first two books in the Kendra Donovan series. A modern FBI agent goes back in time and must help solve murder mysteries! I can’t wait for more! Growing Pains by Cass Lennox- the third in the Toronto Connections series; each book is a different couple but they show previous characters if you want to read in order. Features dance and second chance romance! M/M fiction. Fast Connection by Megan Erickson and Santino Hassell – these two authors are amazing and their series together (Cyberlove) should definitely be read if you love m/m fiction. Fast Connection is one of my favorites out of them all! Shelter the Sea by Heidi Cullinan – this is a sequel and it follows the same exact characters from Carry the Ocean, so I’d read them in order. One of my all-time favorite m/m novels. Focuses on a guy with autism and another that has anxiety/depression and how they fall in love and help each other. Beautiful novels, very realistic. Midnight at the Bright Ideas Bookstore by Matthew J. Sullivan – such a great mystery that revolves around a bookstore and books! I guessed certain aspects, but it didn’t take away my enjoyment at all! At Attention by Annabeth Albert – one of my favorite m/m authors and I love her Out of Uniform series. This is the second, but all the books are companion novels so you don’t have to read in order. History Is All You Left Me is definitely one of my favorite reads of 2017 as well! Scythe and Hunting Prince Dracula areon my TBR so happy to hear you loved them so much! So many great book suggestions here! We Now Return to Regular Life sounds fascinating! I haven’t read any of these! I’m planning a books I read wrap up post for next week! I love that you cover all genres and ages! This is a great round-up. I hope you had a very Merry Christmas my friend and Happy New Year to you! I love looking back on my favorite books from the year. Looks like you have some good ones from 2017! I like that you included middle grade, YA, and adult books on this list. So many are on my TBR too. Can’t wait to read them! I loved the first Croak book, I will definitely have to pick up Rogue. Thanks for sharing! Looks like some really great reads to add to my TBR list for 2018! Happy New Year! 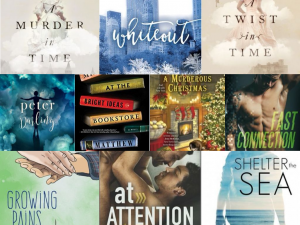 I’m so impressed by all of your reading, I love seeing your top picks for the year! So many great choices here! I finally read A Man Called Ove this year and I adored it. It’s easy to fall into despair when we lose someone and this story reminds me of how God will work in your life. I haven’t read any of these books! Great list! You always have such great reading suggestions. So many books, so little time to read!! the midnight bookstore one is on my list, i keep hearing good things. i loved the kendra donovan series, though the 2nd was a bit of a let down for me, not bad exactly, just not as good as the first. i seriously cannot wait for the 3rd one. I totally need some book recs! I can’t say that I’m familiar with any of these, but that’s what so great about linkups – they expose me to books I might not otherwise every hear of! Visiting from SUYB! Happy Holidays to you! We Now Return to Regular Life was such an amazing read. Such an emotional story and my heart hurt again and again for the characters. How is it that I haven’t heard of most of these books?!! I will be checking out some of those middle grade books since I’m always looking for good books for my kids to read! I just finished Refugee, what a heartbreaking story!! i will be referring back to this post because im always looking for new book recommendations. thank you for sharing. All of these sound really good, but I’m putting Midnight at the Bright Ideas Bookstore at the top of my list for 2018! This is a great list! I need to add some of these to my lineup! Bright Ideas Bookstore and Adam Silvera’s new book both my my honorable mention list. This is a great in-depth list, I especially am interested in the book about Dracula, sounds interesting! I’ve been looking for some new books to read on my kindle. What a fun and great list to read. All of these books sounds fantastic! Thank you so much for sharing your list! I have Scythe sitting on my bookshelf and I can’t wait to read it! I love me a good book! Thanks for all the recommendations! Tanya at Girl Plus Books brought We Now Return to Regular Life to my attention, and now you are singing its praises too. I feel like I really need to read it. Oh, you should! It’s a top favorite of mine! Thank you for all the recommendations! I definitely have to put a few of those books on my “to read” list. I always love seeing these posts, they are always so much fun and so bad for my TBR pile LOL! Refugee sounds really good. I also have A Murder in Time on my TBR list!! SCYTHE!!! Yay for Scythe! I can’t wait for the sequel. I have Refugee staring at me on my bookshelf, just waiting to be read. Need to do that!! Feel free to link this up to my Monthly Wrap-Up Round-Up. I’m including all end-of-year posts in addition to month wrap-ups this month! Peter Darling sounds so interesting!! I keep hearing about Midnight at the Bright Ideas Bookstore, I really need to read that one. It’s so fun seeing everyone’s top reads. I was proud of myself to read 16 books in 2016 (and I may get one more done!). I have not heard of any of these, just goes to show how many books are out there. Hope you had a fabulous Christmas!!! We Wish You A Murderous Christmas is one I want to read (love holiday cozies), and the McElwain books sound good too. So does Midnight at the Bright Ideas Bookstore actually. Scythe and Rogue sound really good and are my favorite kind of YA book. I like more fantasy in my YA versus romance or too high schooley because I’m an old coot! Oh Hunting Prince Dracula looks good! I still need to get to History is All You Left Me. I just finished We Wish You a Murderous Christmas and enjoyed it! I love how you broke your list down into the 3 categories. I’m going to put Refuge on my tbr & I really enjoyed Midnight at the Bright Ideas Bookstore too! I had completely forgotten about the Murder in Time series! I love time travel books, and I’m pretty sure that I have this book, so I just need to make the time to read it! I love that you showed books from different categories. I still need to read Refugee and Scythe. I’ve heard good things about both of them.